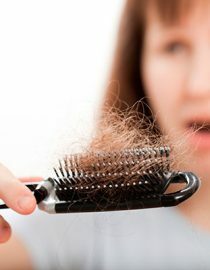 Menopause and Hair Loss: Is Menopause Making My Hair Fall Out?? Does Menopause Cause Hair Loss? I have always been ridiculously precious about my hair. As a child I had long baby blonde hair that made me at look angelic. Inevitably as I grew older my hair turned darker – the first of many changes caused by my life and hormones. I was brutal with my hair in my late teens and early 20s. My locks were permed, attacked with a hot brush (remember those?) and tongs. It was sprayed with enough hairspray to cause a conflagration and a homemade mix of lemon juice and water in a bid to keep the light blonde streaks the sun added for me as a child. Through the next stage of my life, pregnancy was kind to me and I enjoyed thick, glossy hair, which I chopped off regularly when my babies got to the hair-yanking stage. When my youngest grew out of that stage I let it grow, past my shoulders. The dye box became my friend – I cannot imagine giving in to the grey. Then, as I entered menopause I noticed something unexpected and, to me, very distressing. My hair seemed not only to be thinner, but my hairline was most definitely receding too. Pulling my hair back into a ponytail made it all too apparent that the area around my temples was really quite sparse. I began to panic that I would lose much more of my hair from all over my scalp. This loss, of course, was being caused by menopause combined with harsh treatment. It was time to rethink my hair-care routine. It’s proven that hair loss in women during menopause can have a huge psychological impact, causing depression, anxiety, loss of confidence and self esteem, or even a withdrawal from society. It’s worth getting on top of the problem now before it gets out of hand. Firstly I had a good few inches taken off, and a few more layers cut in. This instantly made my hair feel and look thicker. It gave it more body, which disguised the thinner areas. I changed my shampoo to a gentler one that claimed to be good for older hair. I swap my shampoo brands regularly but now always choose a gentle formulation. I always take time with conditioner. Leave it on for at least a few minutes to work, and comb through gently with a very wide toothed comb. Dying and styling your hair is not good for it. Make sure you leave a good gap between dye jobs and use protective products before heat styling. I treated myself to an ionic hairdryer, which seems to leave my hair smoother and less static and – crucially – dries with quite a cool airflow. I rarely straighten my hair anymore, as it leaves my locks frazzled, but if you must straighten, use good quality straighteners with adjustable heat and don’t iron for longer than absolutely necessary. Remember that sun, wind, air conditioning and central heating can all play havoc with your hair. If you like to swim, chlorinated water too may damage your do. Even if you’ve never bothered before it might be time to think about buying a protective spray with UV blocker (they often come in the form of a spray-in leave-in conditioner) and maybe even specialist shampoo and conditioner for swimmers. Swimming in the sea might give you a cool beach-babe look but ocean-water will dry your hair to the point where it could even break off. Try recreating the look with commercial sea-spray products that incorporate moisturizing conditioners. Protein and iron-rich diets are good for strengthening your hair (bring on the steak and broccoli!) and vitamin C found in citrus and other fruit will also help, especially as it helps your body absorb iron. Essential fatty acids play a key role in maintaining healthy hair and can be found in lots of foods including salmon, tuna, herring, flaxseed oil, walnuts and almonds. Some menopausal women swear by taking a soy-based supplement to combat hormone-related hair loss. Choose fermented soya beans which are more easily absorbed by the body. These next tips are easier said than done, I know, but try to keep stress to a minimum, get plenty of sleep and try to do some exercise. Exercise will ease stress, help you sleep and improve circulation of blood everywhere, including your scalp. This helps to promote hair growth. Yoga and breathing relaxation methods might also help de-stress, which in turn will help your hair along with other menopause symptoms. Has your underarm hair stopped growing? For lots of women, this may come as a pleasant surprise, but no underarm hair growth could also concern women who don’t know it’s related to menopause. Much like the hair on your head, underarm hair is impacted by hormone levels in flux and a poorly functioning thyroid. Some women experience underarm hair loss, and some experience the opposite, with thicker, coarser hair growing in. As your body starts to produce less estrogen and progesterone, it throws your body out of whack. I know — it seems like there is nothing menopause leaves untouched. As a result, your armpit hair can fall out or thin just as the hair on the rest of your body. If you’re taking measures to remedy hair loss on your head, it should also help underarm hair loss. Hormone replacement therapy (HRT) could be very useful in balancing your ever-changing hormones out, so speak with your doctor to find out if the treatment is right for you. And if you’re someone who dreaded having to shave your underarms pre-menopause? Well just thank your lucky stars that menopause has granted you this one upside — you can put down the razor and shaving cream! If your hairline or bald patches are worrying you or making you feel decrepit, taking steps to prevent further hair loss and improve re-growth could restore your feelings of vitality and even make you feel younger, especially if, like me, your hair is your pride and joy. Be gentle with your hair – your tresses will thank you. The most popular New Life Outlook menopause articles of 2014, as chosen by our Facebook fans.